Since 2009, we have been delivering FUN all over the New Orleans area to thousands of customers. 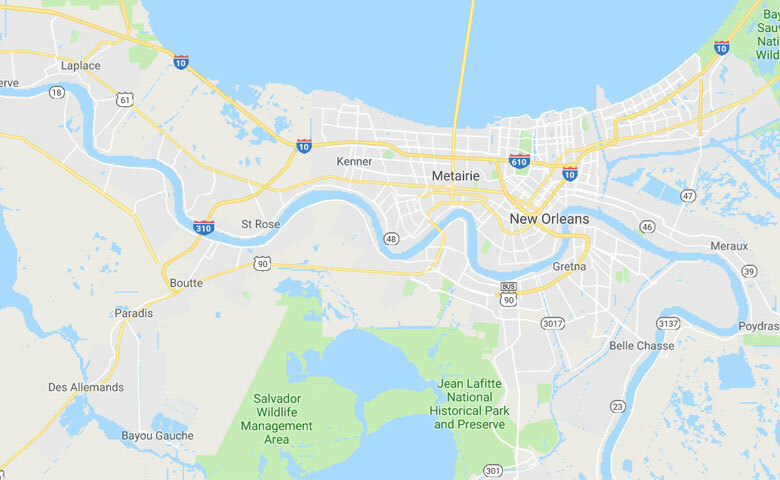 Our delivery area consists of the parishes located around the City of New Orleans such as: Jefferson, Orleans, Plaquemines, St. Bernard, St. Charles and St. John. Most cites are FREE delivery! Browse our list below of each city we have delivered our inflatable party rentals for everyone to enjoy. We currently serve the New Orleans and River Parishes areas including but not limited to: St. Charles, St. John, St. James, Jefferson, Orleans, and St. Bernard. Do not forget to check out our Hot Deals of the week and Coupons prior to reserving for the latest discounts on inflatable party rentals! A - Please check out our policies page for details. My party went perfect and could not have asked for a better business to use. The pick up was just as good as the delivery. They showed up and within 20 minutes they were gone, definitely will be telling everyone about party zone and can't wait to rent again. 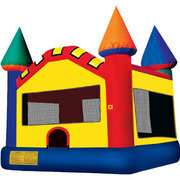 Rented multiple items from PartyZone Inflatables and everything was always clean and worked great! If you want a great deal and friendly service call them. 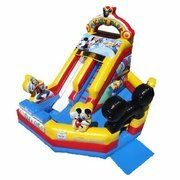 I had a great experience using PartyZone Inflatables. Great customer service and an awesome water slide!! 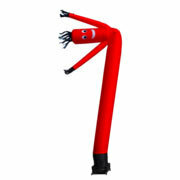 If you need any type of inflatable, I highly recommend that you call Party Zone Inflatables! 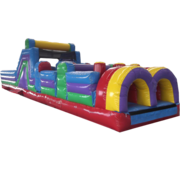 All of our inflatable party rentals and event rentals New Orleans can be easily and conveniently ordered right through our website. We offer up to date availability, so choosing your event rentals is as easy as pursuing our options and clicking add to cart. 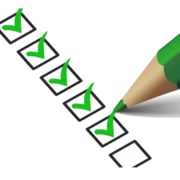 You tell us what date your event is and we show you exactly what is available. 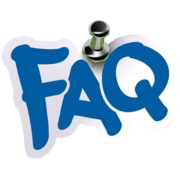 Have questions before ordering? No worries! 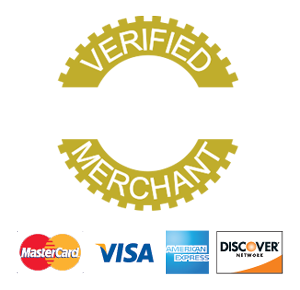 We are available through chat via our website or we are just a quick email or phone call away. 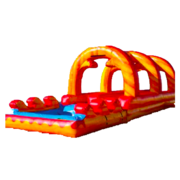 We make ordering inflatable party rentals a cinch! All of our event rentals New Orleans include professional set up and take down. We make sure that you rentals are set up properly and ready to go before your guests arrive. This means that we show up anywhere from one to three hours prior to the start of your event. We take the hassle out of party planning and set up. You can rest assured that our highly qualified staff will deliver and safely set up all of your equipment, so you can focus on other things. 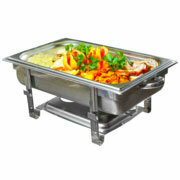 There is no extra charge for delivery and set up, it's included in the price! The same goes for take down at the end of the event, we take care of it all so you don't have to. Above all else, we take pride in providing top notch customer service. We are so confident that you will be completely satisfied with PartyZone from start to finish that we guarantee your satisfaction. We go above and beyond for our customers by both providing exceptional customer service and a clean, reliable and safe event rental. 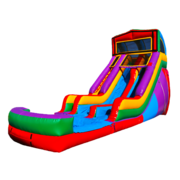 When you choose PartyZone you never have to worry about getting a damaged or dirty inflatable party rental. Our rentals are meticulously cleaned after each use and thoroughly checked for any faults. Your safety and the safety of your guests is our number one priority. PartyZone takes great prides in the fact that we are a locally owned and operated New Orleans event rental company since 2009 who serves all of New Orleans and the surrounding river parishes. When you pick up the phone to call us, you are getting a local agent who is familiar with the area and can best help you to plan your event. 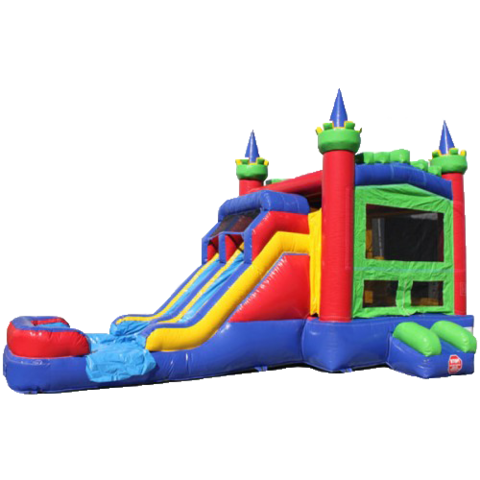 We encourage you to browse our website to see our extensive inflatable party rentals and event rentals, you are sure to find exactly what you need for your next event at prices and service that cannot be beat! 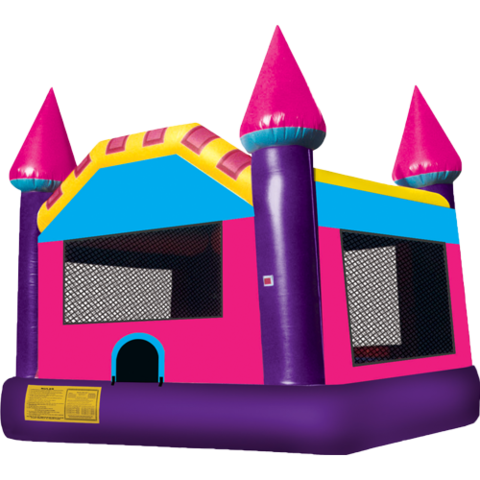 Welcome to PartyZone Event Rentals! Home of the best selection of party rentals and event rentals in New Orleans, LA. We are a locally owned and operated company right here in New Orleans, Louisiana. 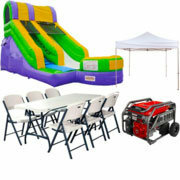 Since 2009, our company has been providing high quality party rentals for all kinds of event types and sizes. 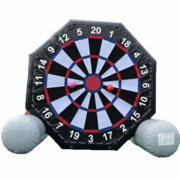 We have the largest selection of inflatable rentals and great assortment of event rentals in New Orleans. We invite you to explore our vast selection of party rentals to find the perfect compliment to your next event. Whether you are hosting a backyard birthday party, corporate function, school fair, or any other type of event that you can think of, we have what it takes to make your party one to remember! 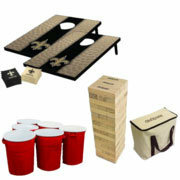 PartyZone is your one stop shop for party and event rentals in New Orleans. 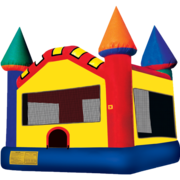 We offer a host of inflatables including bounce houses and water slides, obstacle courses, dunk tanks, interactive party games, photo booths, tent/table/chair rental, concessions, catering and more! The professional team at PartyZone is equipped to handle any sized event and we help you to make sure it goes off without a hitch. Our dedication to superior customer service makes us stand out from our competition. Safety is our priority and we go above and beyond to make sure that our inflatable rentals are safe for you and your guests. 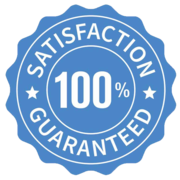 We take pride in our professional promise to our customers and guarantee their satisfaction. Our promise includes on time deliveries, clean and quality equipment, and professional customer service! So, go ahead and check out our vast selection of party rentals and book your next New Orleans event with PartyZone online today! Ready to make a statement at your next event? 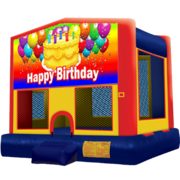 You can't go wrong with our high-quality inflatable party rentals! We have something for everyone that allows you to be a guest at your own event. From bounce houses, to water slides to obstacles courses, our vast selection of inflatables are ready to impress and entertain your guests for hours. 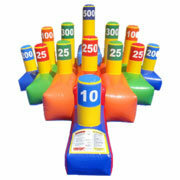 Inflatable party rentals provide safe, interactive fun to guests of all ages and sizes. Want to learn more? 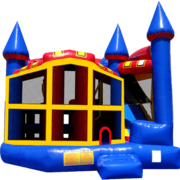 We invite you to browse our extensive inventory of inflatable party rentals. 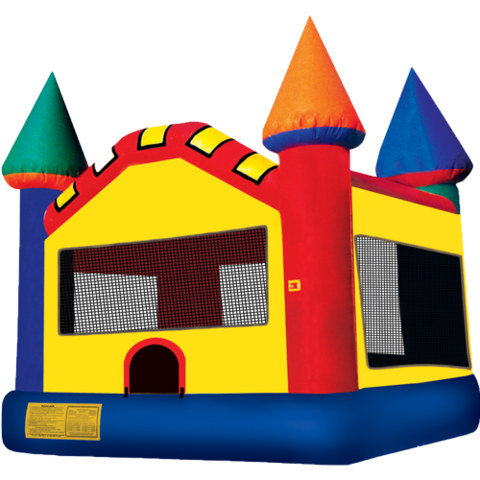 You can't go wrong with a tried and true bounce house rental from PartyZone. No one can resist the jumping temptation! 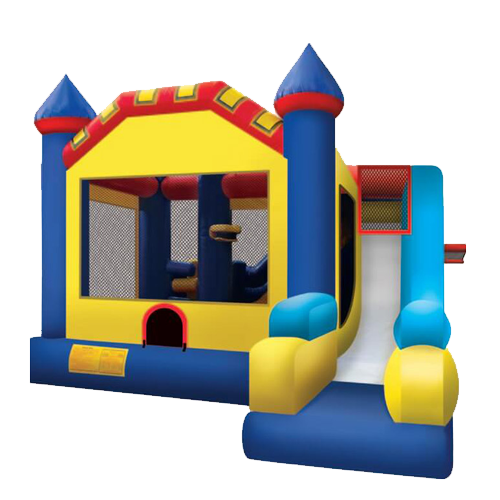 With so many themes to choose from, you can find the perfect bounce house theme to compliment your event. 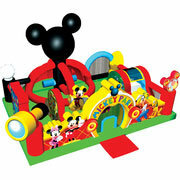 From your basic happy birthday theme to Mickey Mouse, you are sure to find one that'll impress. It's no secret that kids love to bounce. Take an energetic kid and let them bounce around for awhile and they will not only have a blast, but be tired out to boot! Kids of all ages can have fun in a bounce house rental. Want to step your bounce house game up a notch? Why not try a combo bouncer? 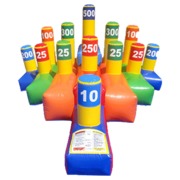 Combo bouncers feature the jumping fun of a traditional bounce house but combine some additional features that will keep the party going for hours. 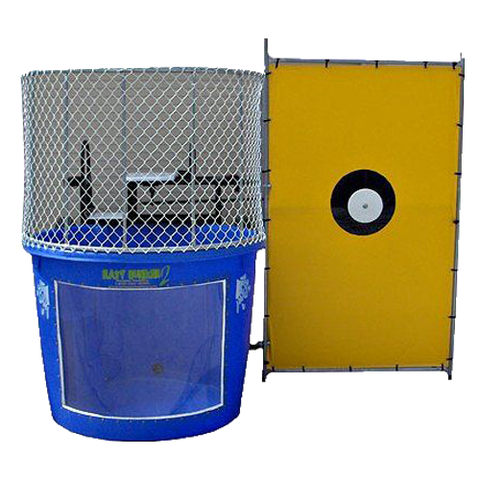 We have the largest selection of combo bouncers in New Orleans, ranging from 4n1, 5n1 and 7n1 units. So go ahead and pick the one that you think will best entertain your party crowd. 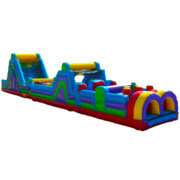 Anticipating little jumpers at your event? Don't worry about keeping a constant eye on the big kids, making sure they don't trample the little guys-rent a toddler bouncer! We have an amazing Mickey Park Learning Club for the little ones! 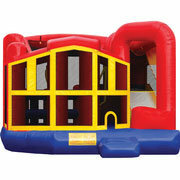 Toddler bouncers are perfect for ages 3-6 and provide endless entertainment in a safe manner for the little ones. 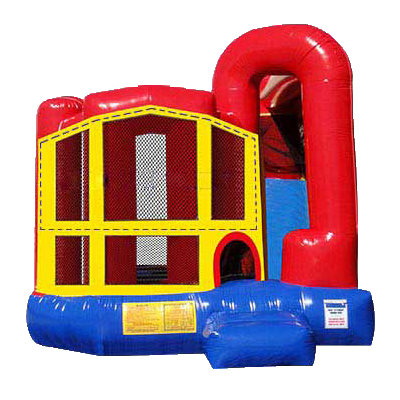 Toddler bouncers are designed to be smaller and easily accessible for the toddler crowd and ensures that they, too, are having a great time. Is your event outdoors in the summer? 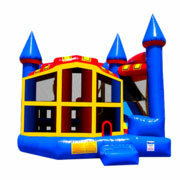 If so, you may want to check out our wet dry combo bounce houses. These combine the fun of a bounce house with the refreshing splash of a water slide. 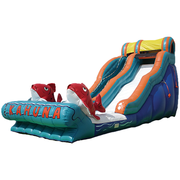 Turn your inflatable party rental into a mini water park by renting a wet/dry combo for your next outdoor event! If your next New Orleans event is outside in the summer, you need an inflatable water slide rental-there is no question about it! There is nothing worse than hot, sweaty and irritable party goers who have no means to cool off. Keep your guest cool as a cucumber by renting one of our many inflatable water slides! 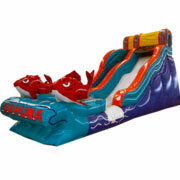 We have the largest selection of water slides in the area, ranging from 13 ft to 22 ft tall. 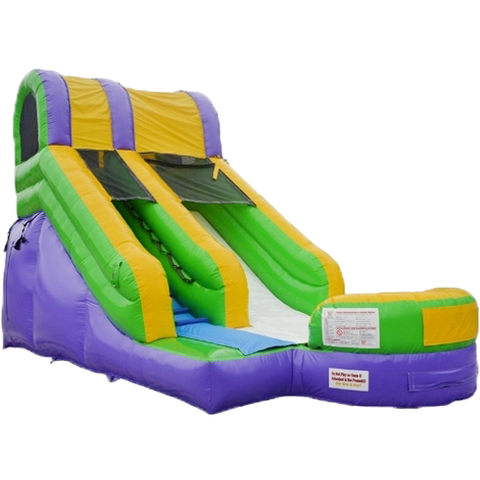 So whether you are hosting a backyard BBQ or a giant corporate event, we have the perfect slide for your party. 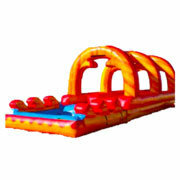 Check our the giant inflatable water slides, 22ft Tropical Tsunami or the 18ft Modular Dual Lane! Don't forget about the fun inflatable slip n slides, a classic but new and improved. 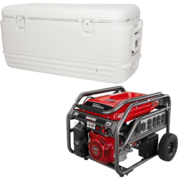 Hosting your event in a cooler season? Great! 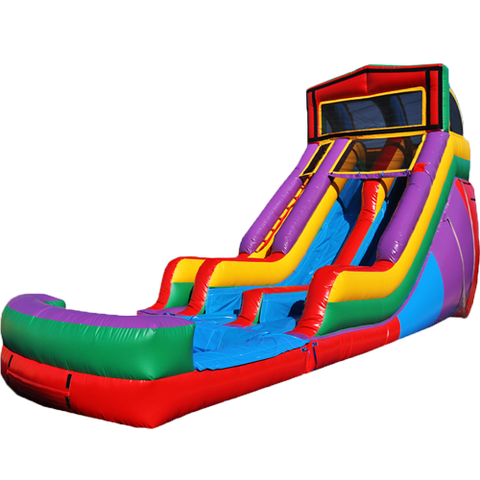 We also offer dry inflatable slides. Don't let the cooler weather deter you from providing your guests with sliding fun. 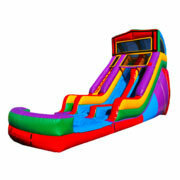 Incite some fun and competition in your guests by renting an inflatable slide to slide down for hours of entertainment! Safe for everyone at the party, from toddler to adults. 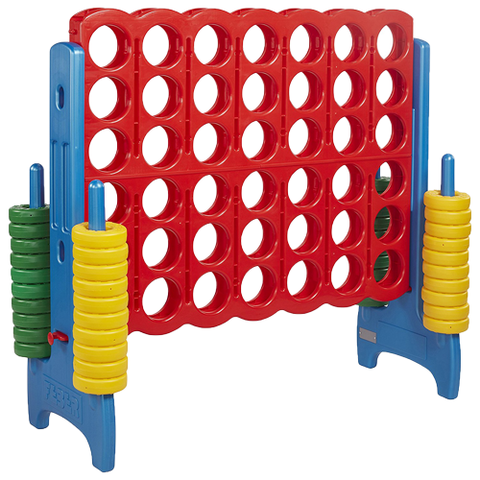 Keep your guests entertained and engaged for hours with PartyZone's obstacle course rentals! There is no better way to get some friendly competition going than to rent an obstacle course for your next event. Everyone, from children to adults, can join in on the fun! 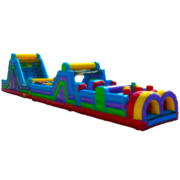 We offer various sizes and styles of obstacle courses, so you can be sure that you find the perfect one for your party. From a 17 ft rock climb to our 70 ft extreme obstacle challenge, your guests will be climbing, crawling and competing all day. 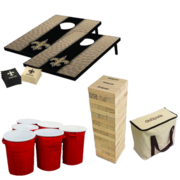 Your one stop shop for event rentals in New Orleans, PartyZone has everything you need to make sure your party goes off without a hitch from start to finish! 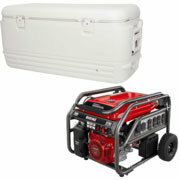 Why rent your event necessities from multiple places when you can get it all in once place? Trust our experienced and dedicated team to help you with your event planning from start to finish. Our superior customer service and wide selection of products and services puts us a cut above the competition. We are your go to party planning source in New Orleans! Unless you plan to make your guests stand for the whole duration of your party, you need tables and chairs. Let PartyZone make renting them convenient and easy! 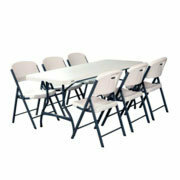 Round or rectangular tables, it's your choice. 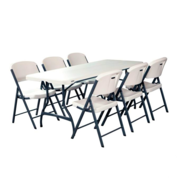 Design your event space exactly as you wish with our clean, sturdy tables and chairs. Our friendly and experienced staff even help set your event up for you just how you want it. No need to recruit party guests into helping set up. 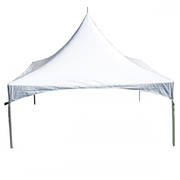 In our experience, having a tent rental at your party is always a good idea. Whether your guests need a reprieve from the sun and heat or there is a chance of a light shower, renting a tent for your next event will make sure you are covered-literally! 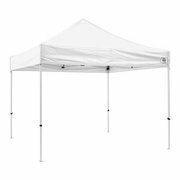 Not only are tents convenient for guests, they help protect your party's food from the elements. Don't take any risks at your next event, make sure you rent a quality tent from PartyZone Event Rentals. 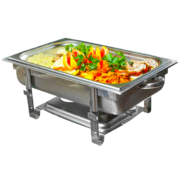 Did you know that PartyZone also offers top of the line catering for New Orleans events? We specialize in making all of your local, Louisiana favorites! Our team of highly qualified chefs are ready to cook up a delicious feast that is sure to please any crowd. We would closely with you to make the event's menu exactly what you wish. Allergies or special requests? Not a problem. We make sure every guest is accommodated to the fullest and enjoys a delicious meal. Looking for some tasty treats to offer for your guests? Add in some of our concessions! PartyZone Event Rentals New Orleans offers delicious concessions for your guests to enjoy. 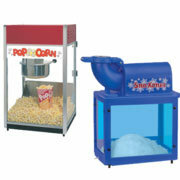 Who doesn't love carnival style popcorn, cotton candy and sno kones? With many flavors to choose from, the snow cones are a perfect choice during the summer months. 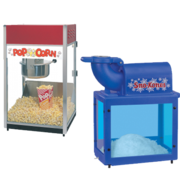 Add these popular concession machine rentals to your next event to really wow your guests! 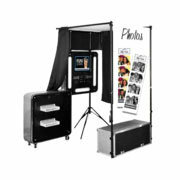 In a world where we document everything, why not rent a photo booth for your next party to encourage guests to get creative and make lasting memories. Photo booths are an awesome way to get guests involved and maybe even get a little silly. They'll love taking home the pictures and reminiscing on the fun! 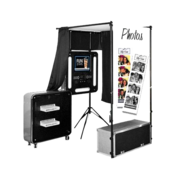 Our photo booths are even capable of emailing or texting you the photos for a digital memory. Who wouldn't enjoy that along with our extensive selection of props? They are perfect for weddings, proms, birthdays and more. There is no better way to get your guests up and out of their chairs than the promise of some good old fashioned competition. PartyZone Event Rentals in New Orleans offers a wide variety of carnival games that are sure to be a hit. 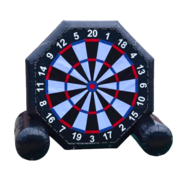 From giant checkers, to led cornole, to a hula hoop toss, we have the carnival games that will keep your guests entertained for hours. Hosting a fundraiser and looking for a creative way to raise money? 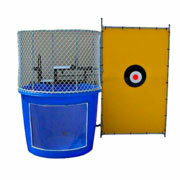 Try a dunk tank rental! No one can resist the fun and laughs that come along with making the dunkee take a plunge. Hosting a corporate or work event? Get the boss up there! Everyone will line up for a shot at taking him or her down. We offer so many event rentals in New Orleans that we came up with party packages to combine all your rental needs in one convenient package and price. We offer a wide variety of packages based on your event size and needs. 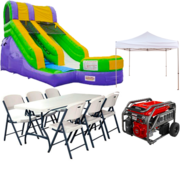 From inflatable party rentals to yard games and tables and chairs, we have packages that are perfect for your next event. All of our packages are highly customizable, and you can even upgrade your event rental package to include fans, coolers and misting systems to provide comfort in the hot weather months. We invite you to browse our party packages and if you don't see one that you like, let us know and we are happy to make a custom package for your event!